When I tell people that my primary area of research is statistical methods, one of the reactions I often encounter from people untrained in statistics is that “you can prove anything with statistics.” Of course, this rankles, first because it isn’t true (unless you use a very strange definition of prove) and second because I’ve spent years learning the limitations of statistics, and there are many limitations. These limitations exist, however, in the context of enormous successes. In the sciences, the field of statistics rightly has a place of honor. This success is evidenced by the great number of scientific arguments that are supported by statistical methods. Not all statistical arguments are created equal, of course. But the respect with which statistics is viewed has the unfortunate downside that a statistical argument can apparently turn a leaden hunch into a golden “truth”. This post is about such statistical alchemy. One of the goals we all have as scientists is to make claims backed by solid evidence. This is harder than it seems. Ideally we would prefer that evidence be ironclad and assumptions unnecessary. In real-life cases, however, the strength of evidence does not provide certainty, and assumptions are needed. The key to good argument, then, is that all assumptions are made explicit, the chain of reasoning is clear and logical, and the resulting evidence is strong enough to garner agreement. Such cases we might call the “gold standard” for scientific arguments. We expect this sort of argument when someone makes a strong claim. This is the stuff that the scientific literature should be made of, for the most part. Among other things, the gold standard requires careful experimental design and execution, deliberate statistical analysis and avoidance of post hoc reasoning, and a willingness to explore the effects of unstated assumptions in one’s reasoning. Hunches are a necessary part of science. Science is driven by a creative force that cannot (at this point) be quantified, and a sneaking suspicion that something is true is often the grounds on which we design experiments. Hunches are some of the most useful things in science, just as lead is an exceptionally useful metal. Like lead, hunches are terribly common. We all have many hunches, and often we don’t know where they come from. What makes a hunch is that it doesn’t have solid grounds to back it up. Hunches often turn to dust upon closer examination: they may contradict other knowledge, they may be based on untenable assumptions, or the evidence for them may turn out to be much weak when we examine it. If a hunch survives a solid test, it is no longer a hunch; but so long we do not test them — or cannot test them — they remain hunches. One of the most dangerous, but unfortunately common, ways in which statistics is used is to magically turn hunches into “truth”. 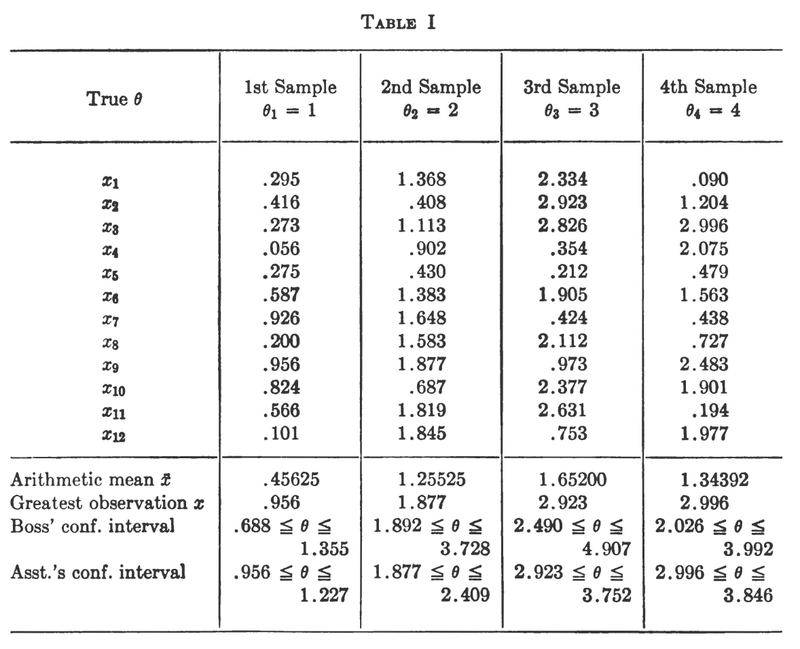 The mother of all statistical alchemy is the Fisherian (p) value, by which hunches based on “low” (p) values are turned into statements about the implausibility of the null hypothesis. Although it seems reasonable, when the hunch on which (p) values rest is examined by either frequentists or Bayesians, it is found wanting. However, my main focus here is not specifically (p) values. I’d like to focus on one particularly recent special case of statistical alchemy among methodologists called the “test for excess significance”. Here’s the hunch: in any series of typically-powered experiments, we expect some to fail to be non-significant due to sampling error, even if a true effect exists. If we see a series of five experiments, and they are all significant, one thinks that either they are either very high powered, the authors got lucky, or there are some nonsignificant studies missing. For many sets of studies, the first seems implausible because the effect sizes are small; the last is important, because if it is true then the picture we get of the results is misleading. Of “biases”, Ioannidis and and Tikalinos say that “biases…result in a relative excess of published statistically significant results as compared with what their true proportion should be in a body of evidence.” If there are too many significant studies, there must be too few nonsignificant ones, hence the idea of “relative” excess. Here we have bit of a mystery. That (E) equals the sum of the expected probabilities is merely asserted. There is no explanation of what assumptions were necessary to derive that fact. Moreover, it is demonstrably false. Suppose I run experiments until I obtain (k) nonsignificant studies ((k>0)). The expected number of significant studies in a set of (n) is exactly (n-k). Depending on the stopping rule for the studies, which is unknown (and unknowable or even meaningless, in most cases), (E) can be chosen to be 0 (stop after (n) nonsignificant studies), (n) (stop after (n) significant studies), or any number in between! Ioannidis and Trikalinos go on to say that “[t]he expected number (E) is compared against the observed number (O) of ‘positive’ studies” and if there are an “excess” then bias is claimed, by standard significance test logic. Here, things go off the rails again. First, as we have seen, (E) could be anything. Second, a significance test is performed by computing the probability of observing an outcome as extreme or more extreme than the one observed, given no “bias”. What is more extreme? Suppose we observe 4 significant results in 5 studies. It seems clear that 5/5 is more extreme. Is 6/6 possible? No mention is made of the assumed sampling process, so how are we to know what the more extreme samples would be? And if a sampling assumption were made explicit, how could we know whether that was a reasonable assumption for the studies at hand? The (p) value is simply incalculable from the information available. Suppose I find a “significant” result; what do I infer? Ioannidis and Trikalinos claim that they “have introduced an exploratory test for examining whether there is an excess of significant findings in a body of evidence” (p 251). This is a very strange assertion. When we do a statistical test, we are not asking a question about the data itself; rather, we are inferring something about a population. The “body of evidence” is the sample; we infer from the sample to the population. But what is the population? Or, put in frequentist terms, what is the sampling process from which the studies in question arise? Given that this question is central to the statistical inference, one would think it would be addressed, but it is not. Dealing with this question would require a clear definition of a “set” of studies, and how this set is sampled. Are these studies one sample of hypothetical sets of studies from all scientific fields? Or perhaps they are a sample of studies within a specific field; say, psychology? Or from a subfield, like social psychology? Or maybe from a specific lab? There’s no way to uniquely answer this question, and so it isn’t clear what can be inferred. Am I inferring bias in all of science, in the field, the subfield, or the lab? And if any of these are true, why do they discuss bias in the sample instead? They have confused the properties of the population and sample in a basic way. But even though these critical details are missing — details that are necessary to the argument — the authors go on to apply this to several meta-analyses, inferring bias in several. Other authors have applied the method to claim “evidence” of bias in other sets of studies. We see that Ioannidis and Trikalinos have unstated assumptions of enormous import, they have failed to clearly define any sort of sampling model, and they have not made clear the link between the act of inference (“we found a ‘significant’ result”) and what is to be inferred (“Evidence for bias exists in these studies.”). And this is all before even addressing the problematic nature of (p) values themselves, which cannot be used as a measure of evidence. The test for “excess significance” is neither a valid frequentist procedure (due to the lack of a clearly defined sampling process) nor a valid Bayesian procedure. But through the alchemy of statistics, the Ioannidis and Trikalinos’ test for “excess significance” has given us the appearance of a justified conclusion. Bodies of studies are called into doubt, and the users of the approach continue to get papers published using the approach despite its utter lack of justification. We would not accept such shoddy modeling and reasoning for studying other aspects of human behavior. As Val Johnson put it in his comment on the procedure, “[We] simply cannot quite determine the level of absurdity that [we are] expected to ignore.” Why is this acceptable for deploying against groups of studies in the scientific literature? The reason is simple: we all have the hunch. It seems right. Ioannidis and Trikalinos have given us a way to transmute our hunch that something is amiss into the gold of a publishable, evidence-backed conclusion. But it is an illusion; the argument simply falls apart under scrutiny. This is bad science, and it should not be tolerated. Methodologists have the same responsibility as everyone else to justify their conclusions. The peer review system has failed to prevent the leaden hunch passing for gold, which is acutely ironic given how methodologists use the test to accuse others of bad science.